The name of Sarah Roberts, who died on 29 November , will not be well known to Classical Guitar readers, few of whom can have attended her debut as a guitarist in the 1970s. She had studied the instrument with her son, the poet, guitarist and guitar historian John David Roberts, author of Guitar Travels, numerous booklets covering aspects of guitar teaching, and many books and booklets of verse. It took courage and determination of a high order to perform, solo, in public for the first time in her middle seventies. Sarah, who came from a family of painters and musicians, was the widow of William Roberts, a leading painter of the English Cubist school (sometimes known as the Vorticists); his work now hangs in most of the country's major galleries, but existence was not easy for most of Sarah's long life. She was the sister of another famous painter, Jacob Kramer, after whom an art college in Leeds was named. The centenary of Kramer's birth (he died in 1962) was celebrated by an exhibition of his work in London last year. One of the exhibits was his Study of a Gipsy, a pastel-and-chalk of an almond-eyed beauty wearing a headscarf. That was Sarah, at the tender age of 15, striking in appearance and full of the energy she retained until well into her nineties. No time spent with Sarah was ever wasted. Her acute powers of observation, her human insight, her eye for detail, her sometimes acerbic (but never malicious or hurtful) tongue made her a delightful conversationalist. After a meeting with her, one felt more alive, more aware of the possibilities of life and art. 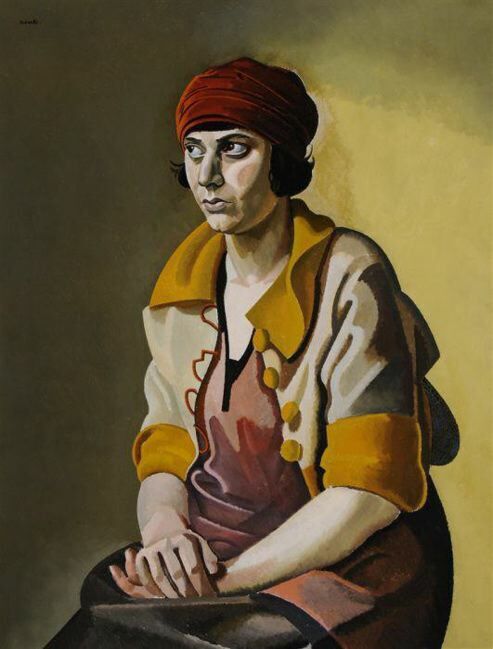 She had known just about every major figure in British art from the early years of the century, including Augustus John, Wyndham Lewis, David Bomberg and William Rothenstein. Her husband had done many of the illustrations for the first edition of T. E. Lawrence's Seven Pillars of Wisdom, and the Roberts family became friendly with 'Lawrence of Arabia', who would often invite them to stay at his cottage in Dorset. Her personality was vibrant and powerful without being in any way abrasive. Like her brother, she retained a distinct bohemian streak. I remember going to review a guitar recital c. 1978 and, approaching the hall, hearing my name called. I turned to see Sarah running (in her late 70s!) to catch me up. She had forgotten to bring her ticket, and wanted to know if I had a spare press ticket. I had to tell her that I was expecting another friend, but a quick telephone call made it clear that the friend could not come. I went in search of Sarah to offer her the other half of my double press ticket, but there was no sign of her. I waited until the doors were about to close, then went inside. It was one of those sparsely attended concerts where the press, the artist's friends and relations and agent form the largest part of the audience. Sarah was sitting comfortably in the second row. I expressed the hope that she had encountered no difficulty over her lack of a ticket. 'I just walked in,'she said simply, and added serenely: 'Nobody stops you when you're my age.' That was the true, unique and irresistible Sarah, whom nobody wished to stop anyway. She was a lone survivor from her generation of artists, and her passing marks the end of an era.